You know that awesome wireless camera that lets your smartphone see just about anywhere? Of course you know it — tens of thousands of our readers have taken advantage of the sales we’ve covered over the past year. Well guess what: there’s a new upgraded version of this awesome accessory, and it’s back on sale at its lowest price ever! The Depstech 1200P WiFi Borescope Inspection Camera features a higher-quality camera than the original model, and it also has a length of 33 feet so it can be snaked into just about anything. $39.99 is more than fair for this incredibly useful gadget, but the coupon code OCNRZTAY slashes the price to just $29.99! 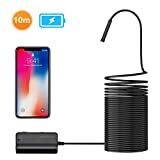 WiFi Connection, High Compatibility: Via WiFi from endoscope WiFi box, this unit can work with Android 2.3+devices excluding Google Pixel 2 temporarily& iOS 6.0+, breaking through different plugs limits.